We’re talking bunless burgers over ‘ere. Wait...what? Bunless burgers? Yep, that's it, a burger sans bun. I feel you’re already judging me. So stop right there and allow me to make an argument for bunless burger, or better yet, for THIS particular bunless burger. If I can't convince you, feel free to leave, but not before you've heard it all. First off, don’t think that a burger without a bun is not a burger. The feeling of forfeit is short-lived when you come up with creative ways of filling the gap. And if the new way happens to be healthier too, then it’s a win-win situation. 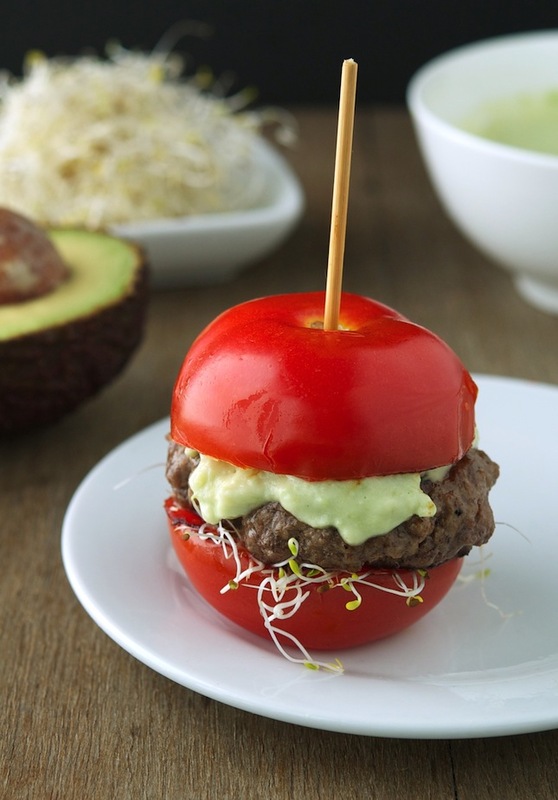 I’m not trying to say this bunless tomato avocado burger is better than a regular burger. It’s not. Or maybe it is. Let’s settle this and say that it’s just different. The bun in a burger holds everything together and soaks up the sauces and the juices. 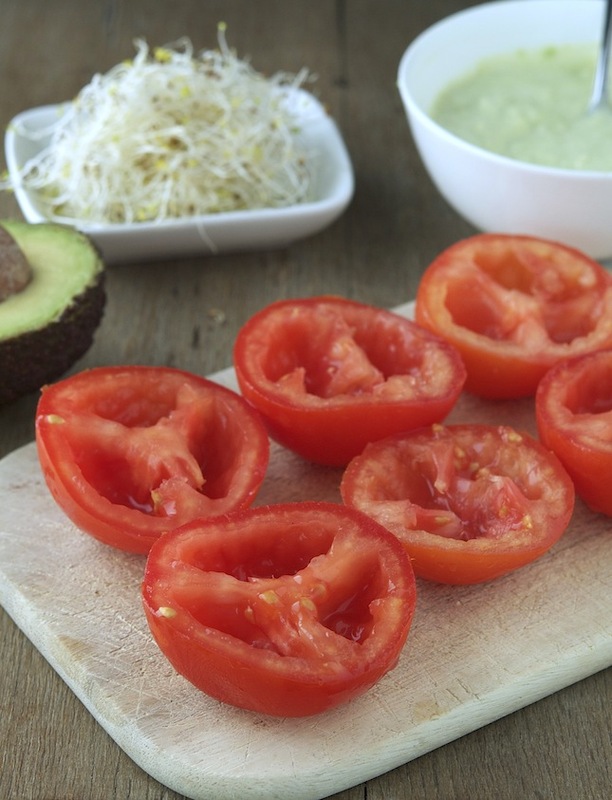 The tomato won’t do these things in the exact same way, but it brings a lot of flavor and freshness. Plus, it’s an awesome low carb and gluten-free alternative. It's also so moist and juicy. Two of the most important features in a burger. I warn you, it’s not going to be super easy to eat it with your hands. Not impossible. Certainly easier than those lettuce wraps/burgers you get served all the time whenever you order a bunless burger. I wanted to use green tomatoes but wasn’t able to find any, so I settled for regular red ones. It’s important to pick tomatoes that are a tad on the unripe side. They will release less juices, have a crunchier consistency and will hold the patty much better. 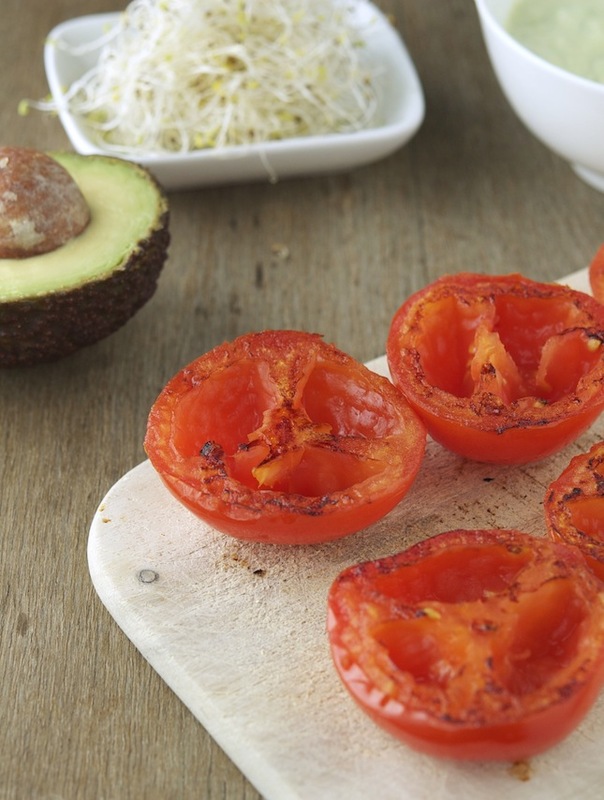 Flavor-wise and taste-wise these tomato avocado burgers are spot on. If you think that eating burgers without a bun is a reprehensible thing to do, you’ll think twice. Promise. 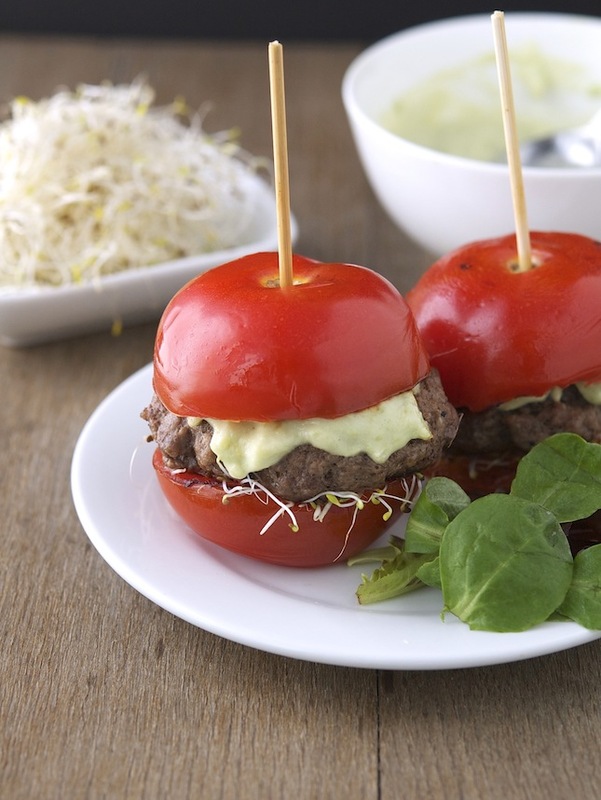 Tomato Avocado Burgers Print this recipe! That's such a great idea for a bunless burger! and let you to feature your best recipes on our website. That looks good, maybe try it with bell peppers? Maybe both! Roasted (still firm) yellow bell on the bottom. Half tomato on top. Savory and sweet bunless burger. I like the idea of no bun. I've tried it with just lettuce leaves but this sounds even better. I couldn't see "avocado" in the ingredients list. Could it be made without and how would that change the taste/nutrition? I looooove the colors and it sounds super yummy too! I'm all for bunless burgers, and this one looks too pretty to eat! I make homemade raw (dehydrated) flat bread by combining water, nuts, seeds, garlic, sea salt & pepper and then use that as my bread for everything. I have been off grains for almost a year now. My health is coming back. Have lost 70 pounds without trying. And truly have been amazed how much I have been able to rebalance my body with the right foods. Have used the lettuce idea before found that messy and boring. Large Portabella mushrooms sauteed with onion are also good but a lil messy. Welcome this idea for a change. Thank you for posting...will definitely try. I made them and the burger was great. Hard to eat but good, good, good! It's probably extremely tasty, but it must be messy as hell. Just curious, do you throw away the tomato seeds? It says set aside but doesn't say for what? You could cut the fat content down more if you don't mix the yogurt and mayo in with the avocado. Still yummy. It's so funny because I just read the ingredients and I too, didn't see the avocado! I totally missed it, don't know how but I did! Totally going to make this with a handful of cilantro instead of sprouts and some jicama strips on the side! Wonderful Idea! How about roma tomatoes...two bite size...just make burgers to fit.